Long-standing city councillor John Holdich has been elected leader of the Conservative group on Peterborough City Council. 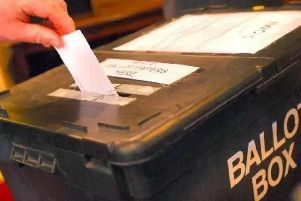 Cllr Holdich was elected unopposed at the Conservative group meeting last night (Tuesday, May 12) with Cllr Wayne Fitzgerald elected as deputy leader - also unopposed. Cllr Holdich is therefore in pole position to be elected leader of Peterborough City Council, replacing Marco Cereste who lost his Stanground Central seat in Thursday’s local election vote. The Conservative group holds 26 seats on the city council and opposition parties and independents hold a total of 30 seats, but it would require a strong opposition coalition to challenge him. Cllr Holdich said that he hoped to be elected council leader and high on his list of priorities would be tackling the council’s budget deficit. “We are dealing with £25m worth of reduction in our government grant and we need to make sure that is dealt with it the fairest and most equitable way. Cllr Holdich, who retained his Glinton and Wittering Ward seat in Thursday’s election vote, was Cabinet member responsible for education in Marco Cereste’s administration. Cllr Holdich is a former Mayor and was first elected to the ciy coumcil in 1979 and was voted group leader unopposed at last night’s meeting. He also paid tribute to Cllr Cereste, following the former leader’s defeat in Thursday’s vote. As well the election of Cllr Holdich as Tory group leader and Cllr Fitzgerald as deputy, Cllr June Stokes was elected group secretary, Cllr Brian Rush is treasurer,Cllr Graham Casey is group policy chairman and Cllr Andy Coles is group press officer. The new city council leader is likely to be elected at next Wednesday’s full council meeting.